Details on the orce of Golarion - their brutish lifestyles, physical qualities, cultural norms and gender roles, governance of warbands, relationship with slavery, and more. A history of the orc race, from their desperate flight during the dwarves' legendary Quest for Sky to their dominance durintg the AGe of Darkness and subsequent fall from power. 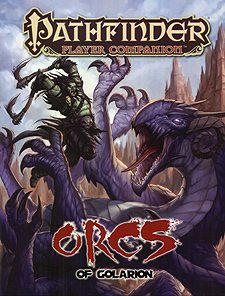 This player friendly Pathfinder Companion works best with the Pathfinder Roleplaying Game or the 3.5 version of the world's oldest fantasy roleplaying game. Although easily incorporated into any fantasy world, it is optimized for the Pathfinder campaign setting.